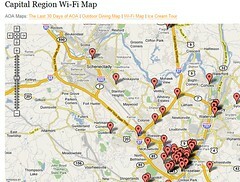 All Over Albany has a handy map of WiFi locations in the greater Capital Region. I see a few libraries on there. Is yours listed? If not, submit it! Thanks for pointing out our map. We’re working on getting a bunch of new places added, but it might take a few days. Hope lots of area libraries submit their info to you. Most of them have free wifi. Now I’m drooling over your ice cream tour map. Yum…..
Next Next post: It’s NOT a search engine – Wolfram Alpha – try it!